Cappadocia or Capadocia in Turkish, is a historical region in Central Anatolia in Nevsehir Province in Turkey. The earliest record dates from the late 6th century BC which appears in the trilingual inscription of two early Achaemenid kings Darius I and Xerxes as one the countries of the Old Persian Empire where the Old Persian name was Katpatuka meaning `the land, country of beautiful horses’ and Cappadocia comes from the Luwian or Luvian language which means `Low Country’. Being a historic area of Central Anatolia, it is surrounded by the towns of Hacibektas, Aksarav, Nigde and Kayseri and known as Cappadocia in ancient time and is still called Kapadokya. It is the most striking region specially the `moonscape’, area surrounding the towns of Goreme, Urgup, Uchisar, Avanos and Mustafapasa where due to erosion, caves, clefts, pinnacles, fairy chimney together with sensuous folds in the soft volcanic rocks have been formed. It is best known for its unique moon like landscape together with cave churches, underground cities and houses carved in the rocks. This region has valley, canyon, hills with unusual rock formation which have been created as a result of the eroding rains and winds thousands of years ago, of the lava covered plain which are located between the volcanic mountains Ericyes, Melendiz and Hasan together with its dwellings which have been carved out of rock. Cities were dug out into underground, presenting a different world. The mountain eruptions which lasted until 2 million years ago in geological times seemed to be active volcanoes forming soft layer which was 150 m thick caused by the lavas in the valley surrounded by mountains. 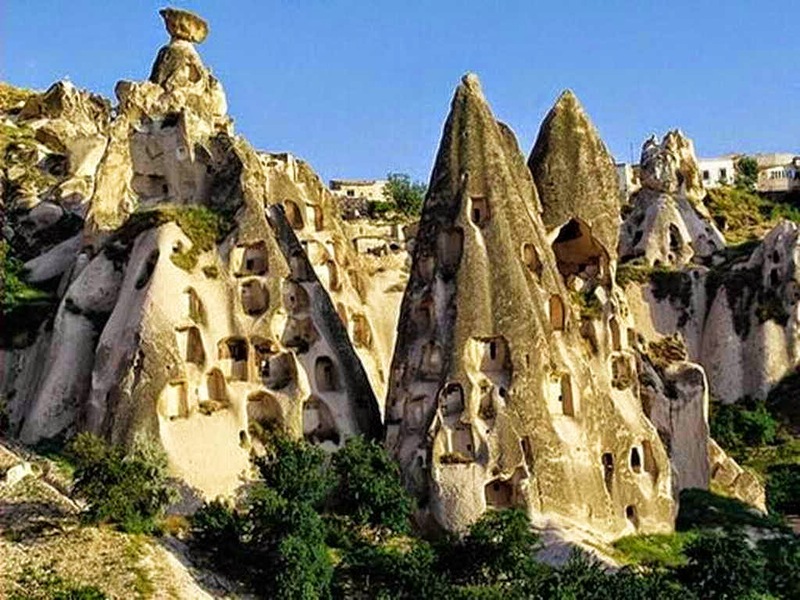 Fairy chimneys were the result of the rivers; flood water running way down the hills of valleys together with strong winds which eroded the geological formations consisting of tuff on the plateau forming tuff layers created these shapes. The Cappadocia Kingdom was formed in 332 BC and during the Roman period it was inhabited by the Christian who carved thousands of cave churches, chapels and monasteries out of the rock. Most of these churches were also decorated with frescoes of medieval saints whose images still gaze from the walls and these ancient churches are an amazing site for visitors. The underground cities were used as hideouts and shelters in Cappadocia by the early Christian.There are various interesting sites in Cappadocia and the main attractions are the two large open air museums and the underground cities. Besides these there are also several small but forgotten rock cut churches and monasteries, spectacular caravanserais, hiking trails, together with dramatic rock formation which are worth exploring. The most comfortable and quickest way to reach Cappadocia is by air where there are two airports, one being Kayseri Erkilet Airport – ASR which is located in Kayseri with a one hour drive to the centre of Cappadocia region. The other is the Turkish Airline which operates several nonstop flights from Istanbul Ataturk Airport to Kayseri Erkilet Airport with daily flights from Izmir to Kayseri through Istanbul. A transfer or shuttle bus is easily available from Kayseri Airport to Cappadocia.